Hi there Happy Friday! I hope you had a good week. I had a good one myself, although its gotten pretty warm again and I'm feeling a bit of a whine come on. Good thing it's Friday! 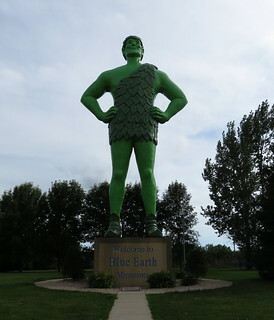 One of the fun things Linda and Mark had planned for me was a trip out to Blue Earth Minnesota. 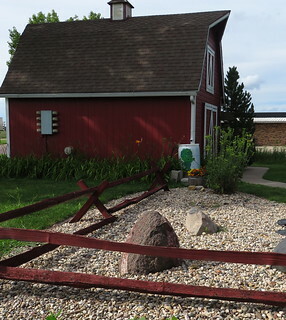 It's about two and half hours out from the Twin Cities, but we broke up the time by stopping at the crazy yellow barn. That alone is a trip on it's own, but we like to cram a lot into a day. Here's a link to a news story on the yellow barn, or rather Jim's Apple Farm, and I hope if you have time you'll head over and watch the little video. It's pretty interesting and won't take up a lot of your time! 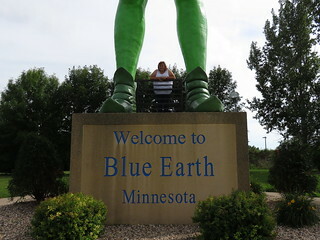 Fueled by a trip through the candy shop and then a stop for coffee we headed south towards Blue Earth. Holy cow, this guys head sticks up way above the surroundings, so they're no missing this from the freeway! Look at his shoes, I'm 5'4" and I'm barely taller than those points! 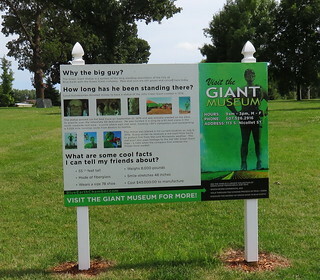 Here are some Giant Facts. I like that the sign says "What are some cool facts I can tell my friends about?".. it's like they knew I was coming! I was disappointed that the museum was closed. Can you imagine the wonderful souvenirs inside? Someday maybe I'll travel back through there and then they'll be mine. I hope there's a snow globe. How awesome would that be? Not to mention probably pretty realistic for winter. Don't you love all the quirky things on road trips!!! This weekend we are in Chicago area and it's cool, in fact I had to go to the Rack and find a warmer jacket....60 degrees is cooler than 60 at home!!! Denver is expecting snow this weekend. Here in the mountains its windy and they say a storm is coming. Not ready for winter one bit! Still want to do some ATVing. What great timing! I'm visiting the big yellow barn tomorrow for the first time. I'm going with my son and his fiance to buy soda pop and candy for their wedding reception! Hope you have a good weekend! 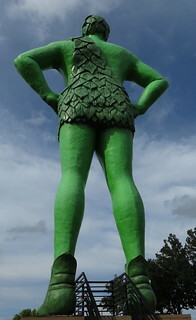 HO HO HO...Green Giant... Now that song is in my head...acckkkk! Glad you had fun! Holy Cow -- look at how big that giant is -- he could squish you like a bug. Don't look up ROFLOL! Have a great weekend -- I have BIG plans and an airplane is involved haha.